If you read my post, Hard Decisions, you know that mom is trying to find new homes for some of my adopted brothers and sisters. MeoowzResQ had their regular Sunday adoption event at the Petco in Anaheim yesterday so mom took Fontana to see if someone might see her and fall in love. 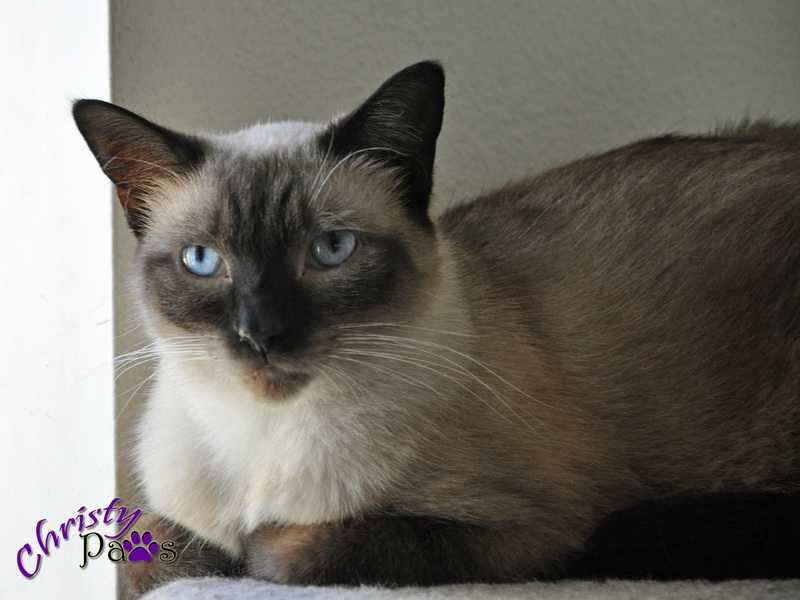 Fontana is a beautiful Siamese mix with gorgeous blue eyes — almost as striking as mine! She is a sweet girl who loves to cuddle. You can read more about her here. She was really scared at first but mom held her for a while and she realized it wasn’t so bad there. Unfortunately, it was a really slow day for adoptions at that Petco. Only one person came in seriously looking to adopt and no kitties went to new homes. So, Fontana is back home for now. After Wednesday, you’ll be able to meet her at the Petco in Orange during regular store hours. I hope she finds a new, loving home very soon! While she was at Petco, mom decided to look for a Halloween costume for me for Sammy’s Funniest Halloween Costume Contest over at One Spoiled Cat. There were only a few costumes left and nothing she really liked (sigh of relief). If she makes it to Fashion Island to look for a carrier for me, she said she will look again there. If not, hello Photoshop! What she didn’t tell me when she got home yesterday, is that what she did buy me was a new harness! Oh, brother. I was just starting to get used to the one I had and she got this thing that covers my back and has a frilly thing at the bottom. Oh, and some blingy thing. Well, you know what? I surprised even myself. When she put it on, I only slinked around for a minute or two then started walking normally. She took me out to the patio and I actually started exploring! Baby steps, right? Tagged adoption, available for adoption, cat, harness, harness training, MeoowzResQ. Bookmark the permalink. Adorable harness! You look great in it too. Sending purrs and prayers to Fontana and the other for finding new homes. 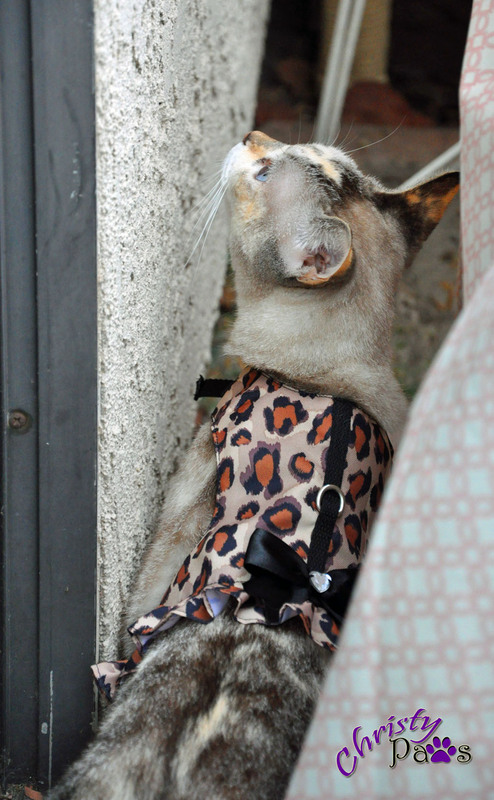 Adorable harness! You look great in it too! Purrs and prayers to Fontana and the others for finding a new home. We think you like that new harness because it looks SO good on you!! You’re stylin’, girl!! Fontana is so gorgeous. We know somebuddy will fall in love with her. That is one stylish harness! We LOVE it! Sending adoption vibes out for Fontana, the beauty! PURRS…. Not a fan of harnesses either but yours is adorable! Hoping you have good luck at Petco, I am partial to them because that is where I adopted my Cody from! Oh wow meez luvs yous new hawness. It looks gweat on yous. Suwe hope new pawsum homes can be found and soon. What a pretty harness! I’d never wear one. Dana is still sharing your post to rehome your kitties several times a day on Twitter. Wow. That is so cool! Thank you. That harness is absolutely GORGEOUS!!! We are huge fans of animal print and you look just stunning in it! Peep #1 has only tried puttin’ a harness on me, once, and that didn’t work out so well… for the peep. I, on the other paw, managed to get myself out of that harness in a jiffy. Just call me Houdini! We’ll see how well this one stays on when the leash is actually attached and she tries to get me to move!